Photos of herbs, spices and other food flavorings. 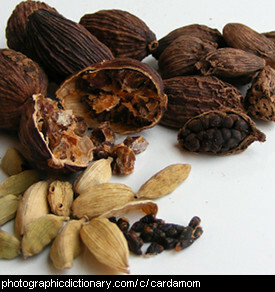 Cardamom refers to a group of related spices in the same family as ginger. Most commercial growing of cardamom is done in India, and cardamom is a common ingredient in Indian food. Cardamom has a strong flavor, and you don't need to add much to your food. 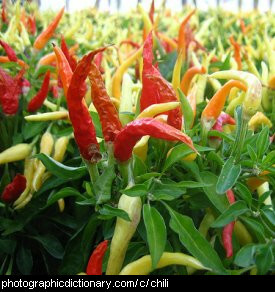 The chili pepper, also spelt chilli, is a small fruit that ranges in colour from green to yellow to red, the most common. The chili is very hot, and when you eat one it feels like your mouth is burning. Chilis are in the same family as the capsicum (bell pepper). 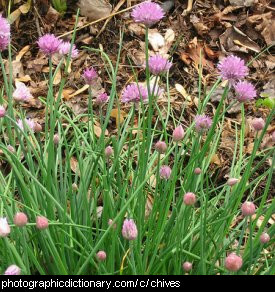 Chives are a member of the onion family. Chives grow in clumps from a bulb under the ground. 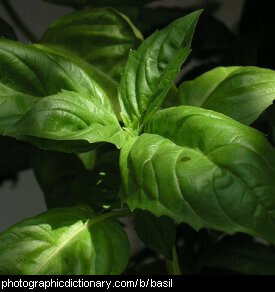 You can use the leaves cut up on salads or on potato or pasta dishes. You can use the flowers in salads too. Chives are very easy to grow from seed, and they can also grow new chives by digging up a clump and splitting off the smaller side bulbs. There are different varieties of chives, one of the most useful being garlic chives, which have leaves and flowers with a strong garlic flavour. Cinnamon is made from the bark of a small tree native to Sri Lanka. The smell and taste comes from an oil that the plant makes. 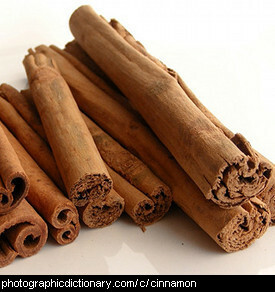 Cinnamon is usually sold as a powder in shops, and is simply the bark of the tree ground into powder. Cinnamon is used in a lot of cooking, mostly in sweet desserts like chocolate dishes, apple pie and many cakes and cookies. Cinnamon is used with sugar on cinnamon donuts. Cloves are the dried flower of a large evergreen tree native to Indonesia and India. They are used whole or ground up in baking, for making cakes, puddings and a lot of Mexican and Indian food. 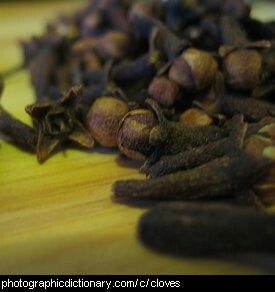 Cloves are very strong, and you don't need much of them to flavour food. Clove oil can be used to stop sore teeth from hurting. Coriander, also called Chinese Parsley, is a soft, fast-growing annual herb - it lives for a year or less. It is very easy to grow from its big, round seeds. 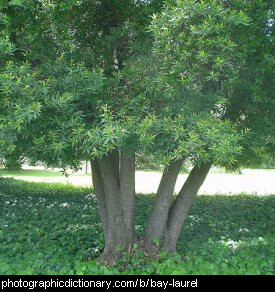 It is best planted in early Spring, and again in Autumn in warmer areas. 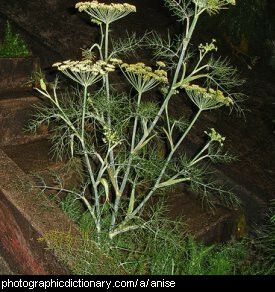 In warm weather it will go to seed very fast so it is best to plant it in a cool, sheltered spot. Coriander leaves are is used fresh in a lot of Asian - particularly Thai, Middle Eastern and African cooking. It is also used in some South American dishes. Both the fresh leaves and the dried seed, powdered or whole, are used in cooking. Ground coriander seed is one of the main ingredients in curry powders and mixed spice. Coriander is also used to flavour cakes, cooked fruits and cookies and goes very well with chicken, fish and vegetable dishes. 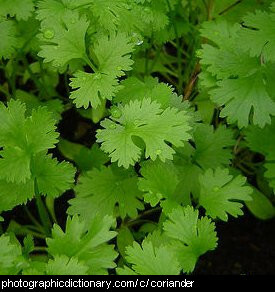 Coriander is though to help digestion and is useful in treating colic. 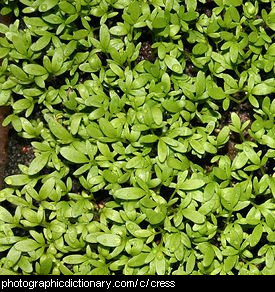 Cress is a herb with a very sharp, peppery taste that is very easy to grow. It is related to mustard. Cress can be grown inside by sprinkling the seeds over some damp potting soil and left on a window ledge. Cress can be harvested simply by cutting the plants off with scissors when they have a few leaves. Cress is very tasty on salads, or in egg and cress sandwiches.